Some courses require a certain Math or English ACT or Accuplacer Score to be eligible to enroll. 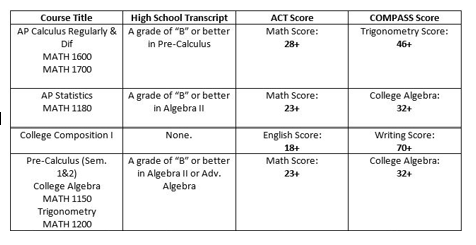 If you have not taken the ACT yet, you may take the Accuplacer test to earn a qualifying score to register for classes. The Accuplacer test is FREE and you make take ONLY the sections needed to earn a qualifying score. If you decide to take the Accuplacer Exam to become eligible to enroll in the DC Advantage Program, please make arrangements to take the exam PRIOR to class registration. You may call and schedule an appointment with the testing center at your earliest convenience.